Ceramics have been a part of my creative heart and profession for over twenty-five years. 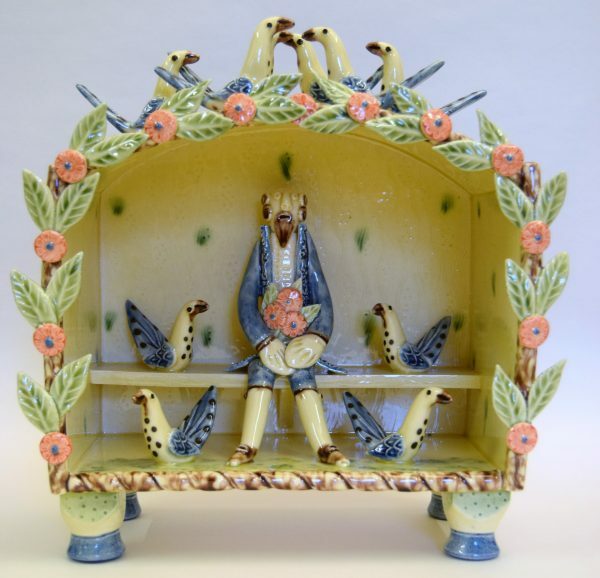 During this time I have been drawn ever closer to the traditions of English earthenware, slipware and European folk art. While taking inspiration from all of these, I feel the strongest bond lies with the Staffordshire wares of the eighteenth century. Potters like Ralph Wood, John Astbury and Thomas Whieldon continue to please, excite and amuse me. Appearing both naive and sophisticated in its execution, their work has a charm and honesty combined with the sheer joy of just being alive. I trained at Sheffield and Chesterfield College of Art in the late 1970s – early 80s and am currently working from a Victorian Railway Station. I attend most major ceramic fairs in the UK and have work in public and private collections. My aim is to fulfil a need, a desire and a passion for making. My hope is to convey a joy, narrative and intrigue for the viewer.